Her first exclusive recording contract was signed in 1995 with Decca for whom she made several recordings: on DVD: La Traviata with the Orchestra of the Royal Opera House Covent Garden, L’elisir d’amore with Orchestre de l'Opéra de Lyon, La Boheme with Orchestra del Teatro alla Scala di Milano, and on CD: Arias with the Orchestra del Teatro Regio di Torino, Verdi Heroines with the Orchestra Sinfonica di MIlano “Giuseppe Verdi”, My World and Mysterium with the London Philharmonic Orchestra. In November 2011 Angela Gheorghiu released Homage to Maria Callas, a collection of beloved opera arias from French and Italian repertoire inspired by Maria Callas’s career and recordings (Marco Armiliato conducts the Royal Philharmonic Orchestra). In March 2014 Warner released the anniversary box “Angela Gheorghiu- the Autograph Collection” containing 8 CDs and 1 DVD. Among major appearances in the last ten years were the much acclaimed performances of La Rondine and Pagliacci at the Royal Opera House, Romeo et Juliette at the Choregies d’Orange and Salzburg Festival, Faust at the Metropolitan Opera in New York, Royal Opera House and Monte Carlo Opera, Simon Boccanegra at the Royal Opera House. There were also recitals in Salzburg (Salzburg Festival) and in Vienna (Musikverein) and concerts in Amsterdam (Queen Beatrix Jubilee Gala), in New York (the New Year’s Eve concert with the New York Philharmonic), Philadelphia (with Philadelphia Orchestra) and Los Angeles, Vancouver and Toronto (April 2011), Seoul, Shanghai, Valladolid (May 2011) in London at O2 Arena together with Placido Domingo (July 2011), a concert for the opening of Katara Amphitheater in Doha, Qatar in December 2011 (performing in a piece especially composed for this event by Vangelis), concert in Oman (April 2012) and a gala concert at Teatro Colon Buenos Aires (April 2012). All these appearances earned spectacular reviews. In 2010 she made her much-acclaimed debut in Cilea’s Adriana Lecouvreur, a new production of the Royal Opera House Covent Garden. 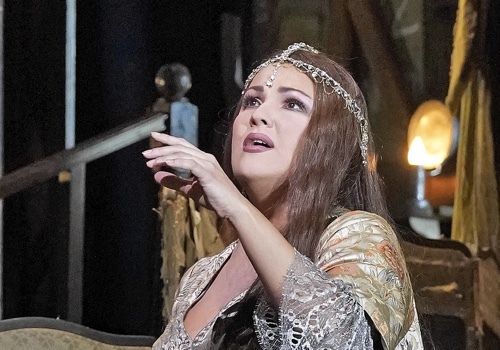 The Observer wrote: "It's hard to imagine anyone bettering Angela Gheorghiu in this part. Her voice, feather-light and creamy yet with a core of steel, matches the liquid way she moves on stage. She's a natural actress and made the improbable death scene heartbreakingly believable and her signature aria "Poveri fiori" simply unforgettable." In July 2011 she sung the title role in Tosca with a stellar cast led by Antonio Pappano. In September 2011 she came back to London for the revival of Faust, performance broadcast live in cinemas. In June 2012 Angela Gheorghiu celebrated 20 years from her debut at Royal Opera House in London performing in La Boheme. In the last years Ms. Gheorghiu had performances of Adriana Lecouvreur, Tosca and La Bohème in Vienna, Paris and London, as well as concerts in Amsterdam, London, Prague, Munich, Hamburg and Vienna (Konzerthaus) and various recitals. In March 2015 year she made her debut in the role of Charlotte in Massenet’s Werther. In August 2015 she sang Werther at the Salzburger Festspiele and a concert in Grafenegg (Austria). In January 2016 she came back to the Royal Opera House with Tosca, an opera she also performed in the Vienna Staatsoper in February and April 2016. All these performances and recitals have confirmed Ms. Gheorghiu’s status as one of the most beloved stars of opera. Ms. Gheorghiu was honoured with “La Medaille Vermeille de la Ville de Paris” and she was appointed an “Officier de l’Ordre des Arts et Lettres” and “Chevalier de l’Ordre des Arts et Lettres” by the French Ministry of Culture and by her native country Romania. In December 2010 she was awarded the honorific title of “Doctor Honoris Causa” by the University of Arts in Iasi (Romania) and the “Star of Romania”, the highest decoration given by the by the President of Romania. In October 2012 she was conferred the “Nihil Sine Deo” royal decoration from His Majesty King Michael I for promoting Romanian cultural values abroad. In October 2014 she was awarded the title “Doctor Honoris Causa” by the Music Academy “Gheorghe Dima” of Cluj-Napoca (Romania). Future engagements include various concerts in Europe and North America, as well as opera performances in London (Adriana Lecouvreur), Vienna (Tosca), Buenos Aires (Adriana Lecouvreur), and Palermo (Adriana Lecouvreur).